With its poor swimming and its tendency to stay in one spot, the seahorse doesn’t go very fast! How tragic then that these beautiful creatures are now holding onto pieces of plastic and their babies are eating tiny micro beads of plastic. As they are composed largely of the plastic polypropylene, cotton buds are a part of the wider plastic pollution problem. 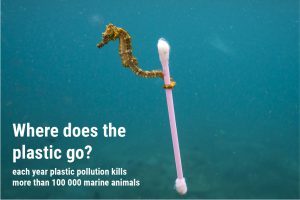 The Marine Conservation Society have described cotton buds as one of the most prevalent varieties of pollution on beaches in the UK. In response to this issue, Johnson & Johnson has vowed to stop selling plastic cotton buds in favour of paper, which is far more biodegradable.